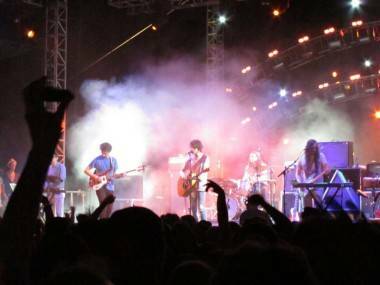 MGMT at Coachella 2010. Duncan Joseph photo. MGMT will play the Commodore Ballroom May 13. The band was founded by Benjamin Goldwasser and Andrew VanWyngarden. Performing live as a five-piece, MGMT continue to entertain through unconventional appearances, including covering Pink Floyd‘s “Lucifer Sam” on Jimmy Fallon while decked out in hardened fisherman’s gear. In November 2011, MGMT performed two nights at the Guggenheim Museum in New York City, creating a unique musical performance to coincide with the opening of Maurizio Cattelan‘s career retrospective All – an installation of over 100 art pieces dangling from the museum’s ceiling through its inner spiral space. In 2012, MGMT took their live show to South America. The duo are currently completing the third MGMT album due for an early summer release. The band have released two full length-length albums so far, 2007’s Oracular Spectacular and 2010’s Congratulations. Tickets go on sale March 8 at 10 a.m. 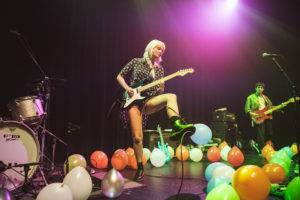 This entry was posted in news and previews and tagged Commodore, concerts, MGMT, Vancouver. Bookmark the permalink.